Zen in Kyoto is not easy to find – yes there are more temples and shrines than convenience stores but most Zen gardens are flooded with selfie stick toting travelers trying to check another temple of their list. Kyoto is known to be the city where Japanese culture was born and shaped into what it is today. Did you know Kyoto has 17 World Heritage sites and about 2,000 temples and shrines across the city. We did manage to find one quiet Buddhist temple and garden where we were the only ones there – more about the temple later. But when we stepped into Four Seasons Kyoto for a day of Spa and lunch we could immediately feel the calm that is missing in most Zen gardens we had visited. Located in Kyoto’s vibrant temple district and just a few minutes cab ride from Kyoto Station, the hotel is set at the foot of the Higashiyama Mountains and within easy reach of Sannen-zaka, a narrow street teeming with traditional merchant homes that now house souvenir shops, tea stalls, and noodle joints. The drive up to the property has some bamboo tree that adds to the atmosphere. There were waterfalls, natural wood panels, tatami walls, and stone pathways that lead to an impressive Teahouse on the 800 year old pond garden. Four Seasons Kyoto like all other properties of Four Seasons is understatedly elegant. It was a tough choice for us when we were planing our trip, we wanted to stay at the Four Seasons but since it was our first time in Japan, we wanted an authentic Ryokan experience and chose to stay at the Kanamean Nishitomiya. Kyoto lacks first-class luxury hotels and with their signature service and well known hospitality standard Four Season fills that void quiet nicely. One afternoon after a few hours of wandering in Gion looking for Geishas, we made it to the Spa at Four Seasons Kyoto and had lunch at the Brasserie that involved no chopsticks. The plush seven-room spa, was a perfect respite after few days of action-packed sightseeing and day of temple visits. The Spa boasts all-natural pampering products and is decked with a VIP couples’ suite, perfect for side-by-side massages. You can opt for a deep tissue massage that stimulates circulation or their signature massage, a special Thai massage to ease and stretch or try the Kyoto heritage massage – therapeutic massage that includes kneading, acupressure, trigger point work and glorious stretches, help to encourage the flow of energy along the body’s meridians, leaving you feeling physically serene and mentally at peace. Before or after your spa visit, you can extend the experience in the Hotel’s pool or whirlpools, and enjoy the relaxing warmth of the steam rooms or saunas. The Four Season Pool is the biggest in Kyoto. While the best part of the Hotel is the 800 year old pond garden, the rooms had all the necessary creature comforts such as walk-in closets, rain showers and televisions, conveniently built into the bathroom mirrors. We had a quick look so we can plan our next visit 🙂 Quirky creations by local artisans, such as washi paper lamps, multicolored throw pillows, and intricate lacquer ware decorate each of the 64 guest rooms, honoring the Japanese minimalist design with their clean lines and natural light. If you can, you should go for the rooms with private outdoor balconies (there are 10 to choose from), which afford picture-perfect views of the jagged Higashiyama Mountains. 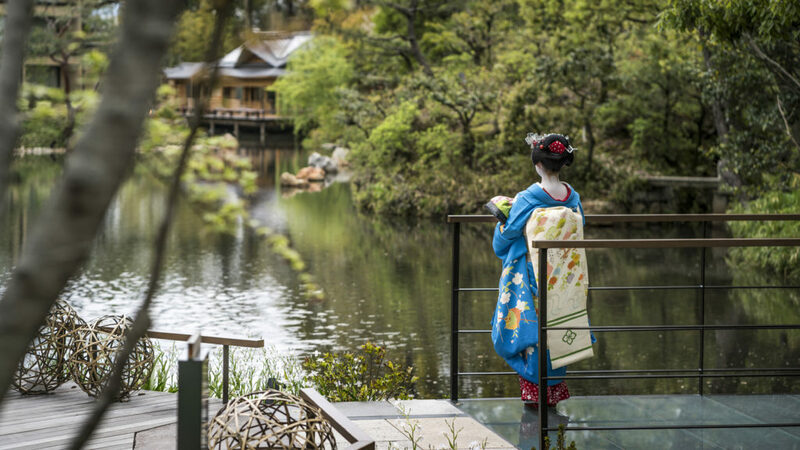 A 200-year-old cypress counter stands in for traditional table service at Wakon on the hotel’s third floor, which overlooks the hotel’s one-of-a-kind pond garden, the menu featured a freshly caught selection of Edo-style sushi. We had lunch at the Brasserie with its double-high ceilings with 30-foot windows that create a boundless sense of space and offer refreshing views of the garden. 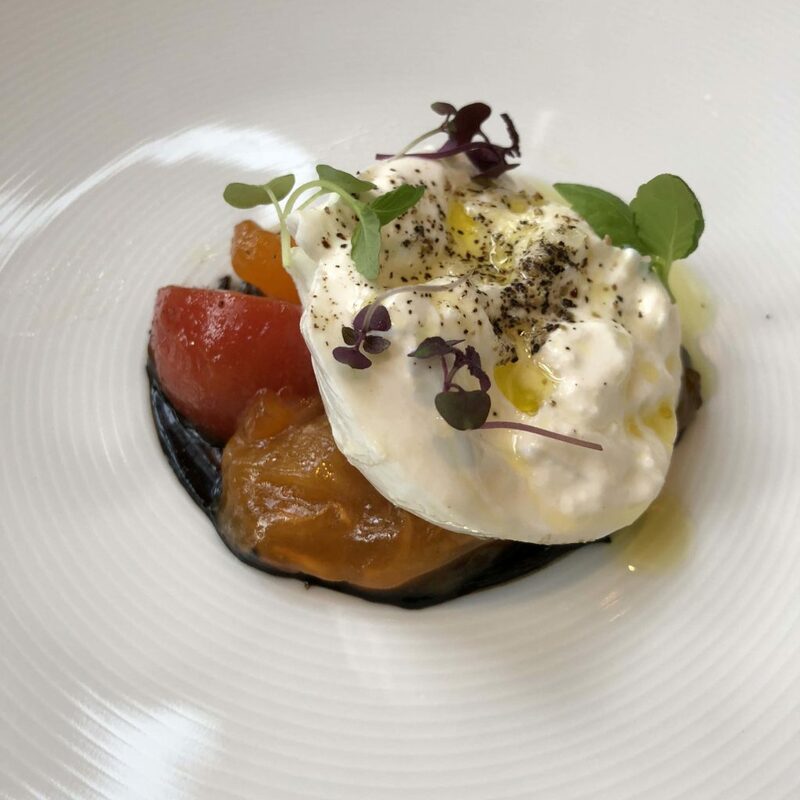 My burrata cheese with fresh persimmon and tomato along with a brown rice risotto loaded with truffles was a welcome change after a few days of Japanese food. Kyoto is birthplace of green tea in Japan, where famous Zen priest Eisai first brought tea seeds from China in the 12th century. Since then, green tea has held center stage in the city – originally as a health tonic for the monks and religious classes and eventually catching the attention of the royal and elite classes where it became the drink of choice. The ceremonious practice of preparing and serving green tea remains part of the culture of city to this day. 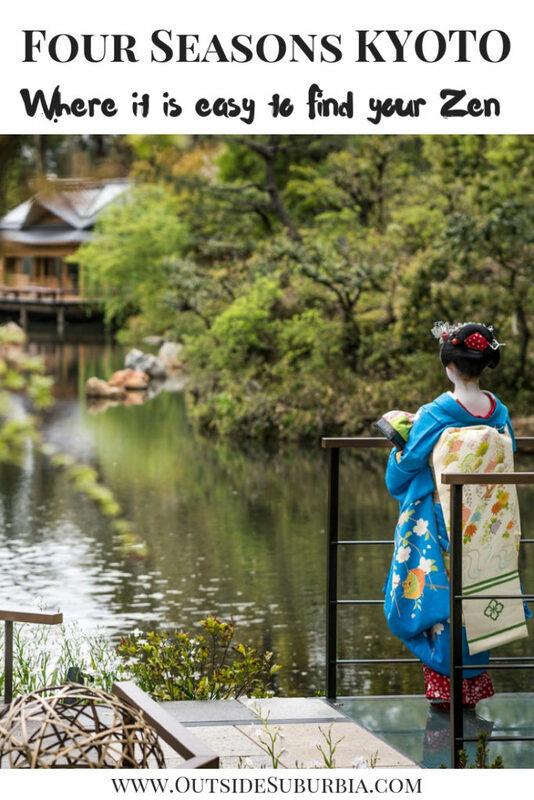 You can get your Zen in a tea cup at the Four Seasons Kyoto – A private Tea Ceremony Experience is available for guests at the tea house Shakusui-tei where you can learn how deeply rooted the slow and graceful movements of the tea ceremony are in Zen Buddhism. Based on the recommendation by the Four Season Kyoto Concierge we tried the an authentic Ninja training experience, and the kids loved being Ninja warriors even if only for a few hours. Even though we spent just an afternoon at Four Seasons Hotel Kyoto enjoying the Spa, the resort ambiance and lunch, it was relaxing and we felt we were in much need of that calming atmosphere the resort provided after a hectic trip visiting the sites around Japan. This was our first time in Japan and Kyoto, so we had opted for a Ryokon stay this time around but if we are ever back in Kyoto (I’m thinking a trip to see the brilliant fall hues of the Japanese maples and another to see the sakuras bloom) we will be staying at Four Seasons Hotel Kyoto for sure.